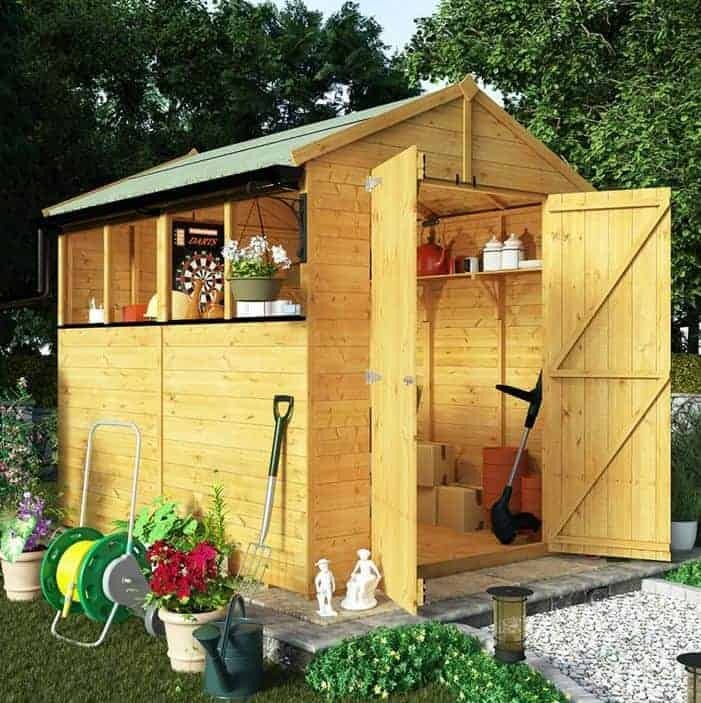 Outside storage sheds can help you take control of your garden, and provide a perfect base for gardening or other hobbies. The very best examples can also make your garden even more visually appealing, and become a much loved talking point in their own right. 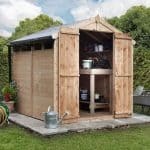 With so many to choose from, selecting the right one for you and your garden can seem confusing; don’t worry, help is at hand with this WhatShed guide to the best outside storage sheds that can be bought online in the UK today. When deciding upon the best outside storage sheds, we were pleased to have found twenty excellent examples deserving of a place within our league table. The rankings themselves are dependent upon many factors, including price and value for money, durability, aesthetic appeal, and value adding features such as extended warranties. We first of all discounted all the storage boxes and small scale sheds that could also be utilised for indoor use. We also insisted upon a maximum base area of eight foot by eight foot, thus concentrating on sheds built primarily for storage purposes and ruling out workshops and summer houses. We found a very large amount of sheds meeting this criteria, so selecting a top twenty and then an ultimate champion was a difficult task. Congratulations then to the Shed Baron Grandale Mountain Blue shed. It represents excellent value for money, is tough with as long a guarantee as any that we see, and we found it visually arresting too. For those reasons it tops our league table of the very best outside storage sheds that can be purchased online in the UK today. 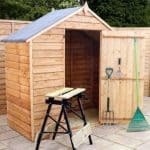 For all kinds of garden building, from sheds to garages, WhatShed bring you independent reviews that can help you make a great purchase. 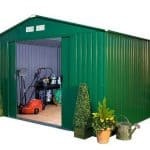 We found high quality outside storage sheds in all substrates, so whether you’re a fan of wood, metal or plastic garden buildings, there’s something for you here. The very top spot in our league table goes to this eye catching example made from galvanised steel. This makes it very tough and weather resistant, as shown by the inclusion of a 20 year manufacturer’s guarantee, which is as long as we’ve seen on any of the sheds we’ve reviewed. This also means that it represents exceptional value for money, and this combination of visual appeal, great value, and durability mean that it deserves to take the number one position. 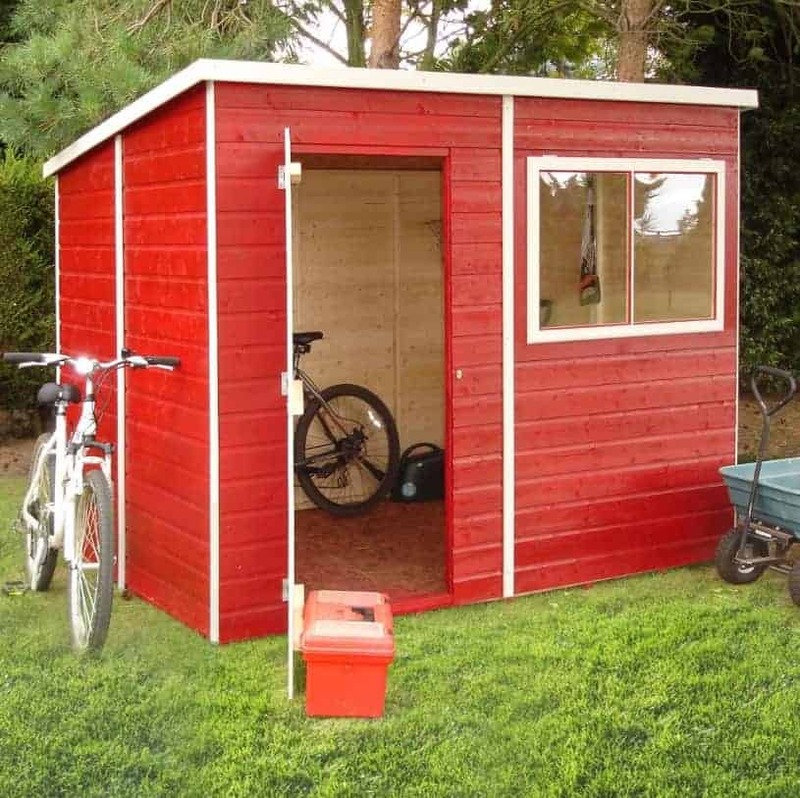 Metal sheds are invariably tough and yet lightweight, making them relatively easy to assemble. We know that some people, however, are put off by the thought of having something too metallic looking in their garden. These six foot by five foot outside storage sheds, however, have a look all of their own, and we found it very striking. That’s because they utilise an attractive blue colour scheme, with cream detailing, that we very rarely see on metal sheds. It really makes these sheds stand out, and so if you want outside storage sheds that are as original as they are useful, then these should be one of your first consideration. The fact that the top two positions in our league table are taken by metal clad outside storage sheds demonstrates just how good value for money they usually are. Of course, cost isn’t the only factor we consider when compiling our rankings, but we know that it is a primary concern to many consumers. 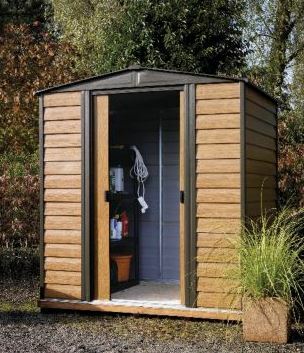 This is the cheapest shed in our guide, with an asking price of less than two hundred pounds, and yet its six foot by four foot storage area means that you can still fit a good selection of tools and equipment inside. We were also pleased to find that it comes with the reassurance of a 15 year warranty against rot, which we feel adds even more value for the customer. The price tag wasn’t the only thing we found attractive about these outside storage sheds. We also liked the dark green colour scheme which, unlike on many metal sheds we see, has been used uniformly across the exterior. This means that it should fit in well with a typical garden environment, rather than looking obtrusive as some silver coloured metal sheds can do. We also liked the inclusion of a sturdy entrance and exit ramp across the entranceway, making it easy to use a trolley or wheelbarrow to move items in our out of storage. This Shed Republic model is the first of the timber outside storage sheds to earn a place in our league table, and whilst it may cost a little more when compared to some similarly sized metal sheds we still feel it offers good value for money when its eight foot by six foot capacity, build quality and stylishness is taken into account. We know that many people prefer the traditional look of a wooden garden shed, and this is high on classic appeal, with an apex roof sitting on top of tongue and groove cladding, with two windows on a side panel allowing natural light inside. We were pleased to find that both of these windows are opening as well, allowing quick and easy ventilation on a hot day. 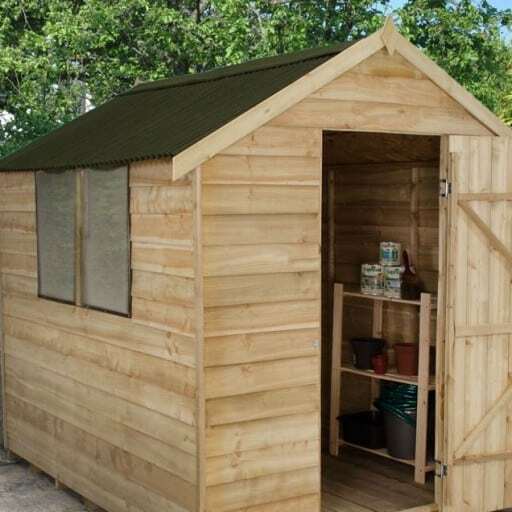 What makes these outdoor storage sheds stand out from many other wooden sheds that we review, is that all the timber has been pressure treated by the manufacturer, giving it excellent durability and resistance to wet rot and insect attack. This means that it comes with a long 15 year guarantee, and it also means that the customer doesn’t have to apply their own preservative coatings on an annual basis during the warranty period, as we often see with wooden sheds. We were equally impressed with the use of toughened glass in the windows, making them virtually shatter proof and therefore safe to use if you have young children or grandchildren. When it comes to timber clad outside storage sheds, we always welcome the slightly greenish tinge that shows the wood has been pressure treated. 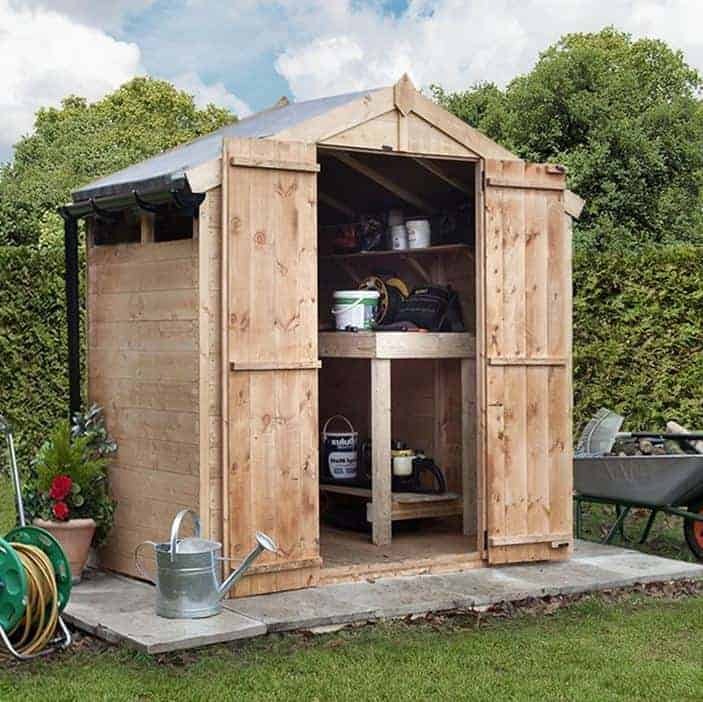 This Shed-Plus shed shares many elements in common with the Shed Republic model that took third place in our league table, including a generous eight foot by six foot storage area, and the initial pressure treatment that brings with it a 15 year guarantee against rot. This shed, however, uses overlap rather than tongue and groove cladding, and this use of a cheaper and thinner main component has been taken into account when determining their respective positions. It also means that it’s much cheaper to buy however, so if you’re looking for a durable storage shed on a tight budget then this could be the one for you. We still found these outside storage sheds pleasing on the eye, and the overlap cladding gives it a rustic look that we’re sure many people will like. 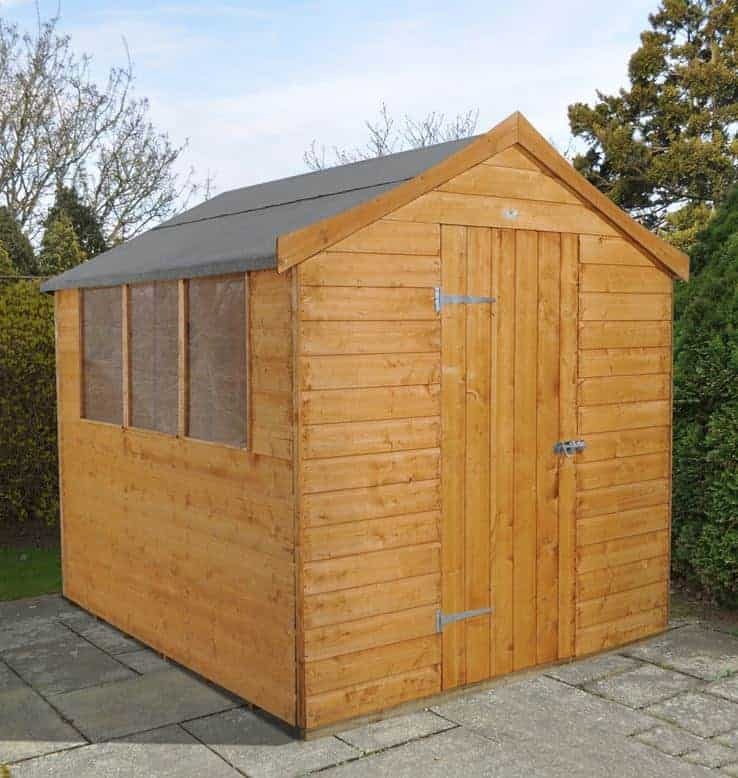 It’s also noticeably taller than many small to mid sized wooden sheds we review, including the Shed Republic model above, with a ridge height of 2.14m and an eaves height of 1.64m. We were also impressed at the use of an onduline roof, as this is a lightweight roofing material that’s easy to manoeuvre and yet very tough and rain resistant. 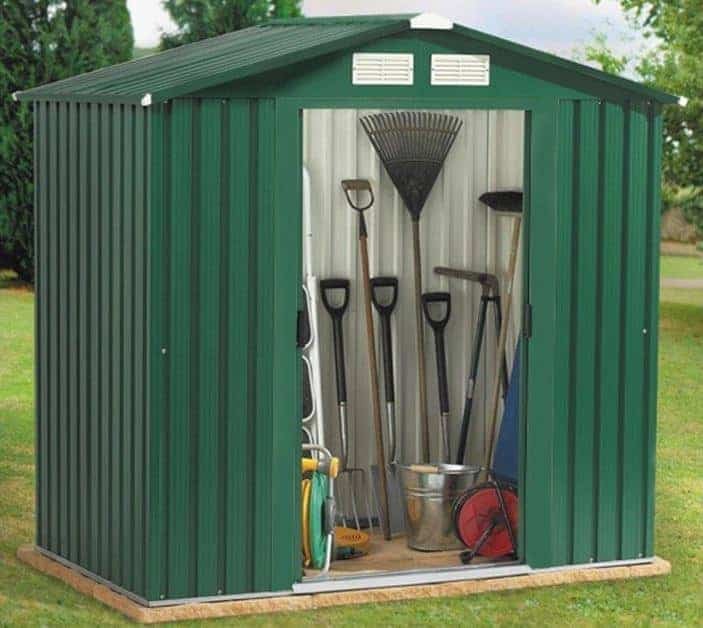 Outside storage sheds make an ideal place to hold your tools and gardening equipment, but that can make them a target for opportune thieves. That’s why we always recommend adding a padlock to sheds that don’t come with one as standard, and a window free design can also boost security by preventing prying eyes from seeing what’s stored inside. It’s a solution that several of the sheds in this league table take, but we liked the alternative solution offered by this BillyOh privacy shed. It does include windows, the light making it easier to store and retrieve items, and it also creates a more pleasant and welcoming interior in our opinion. These windows, however, are tiny and placed high up on the shed, once again making it hard for passers by to see inside. What we were also very impressed with, and which helps these outside storage sheds gain a place inside the top five of our league table, is the asking price of under two hundred pounds. For a six foot by four foot tongue and groove shed with a 10 year guarantee against rot included, this represents superb value for money. It should be noted that a floor isn’t included as standard, but as the cost of adding one can be as little as £21.99 we don’t feel this detracts from the overall value in any way. Plastic outside storage sheds have unique advantages not offered by wooden or metal sheds, as this Palram model demonstrates very well which is why it’s the highest placed plastic clad shed in our league table. Being made of plastic it can’t rot, rust, or crack, and is immune from insect or rodent attack. 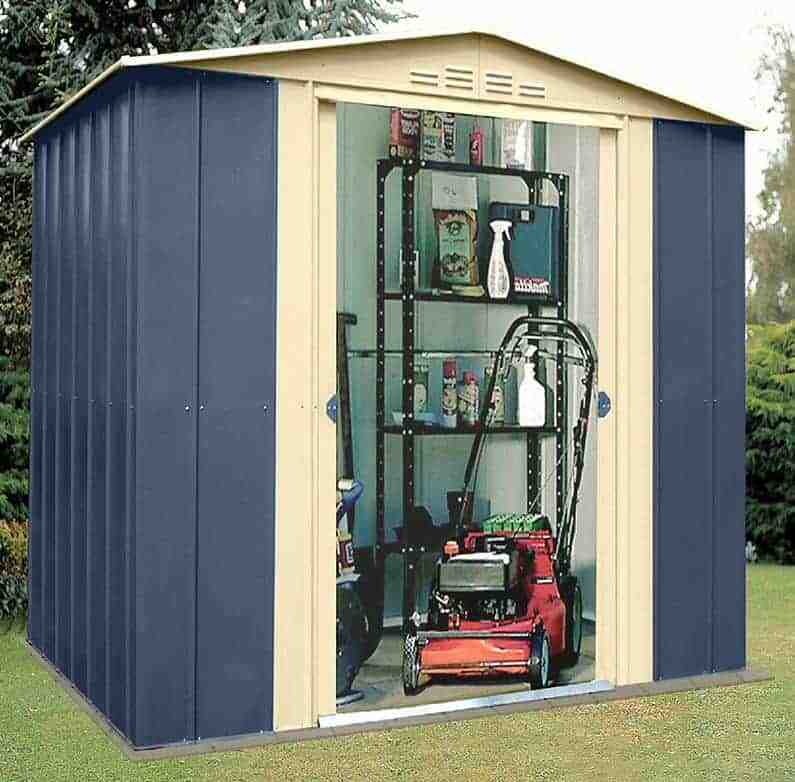 This makes it maintenance free and ideal for people who want to be able to assemble their shed and then forget about it, other than using it to store their items in of course. This saves the owner both time and money, and so we feel that the price tag of less than four hundred pounds is more than reasonable. 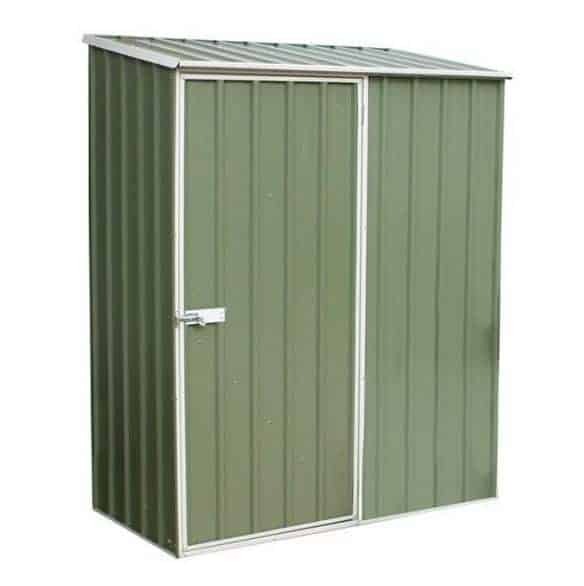 As with metal sheds, we know that some people are not keen on having plastic outside storage sheds in their garden. This is another area in which this Palram shed scores highly, however, as its amber colour scheme gives it a wood like appearance as opposed to the white and beige plastic sheds that we often see. Another feature that we particularly liked was a centrally positioned skylight to compensate for the absence of windows on the side panels, once more meaning that passers by can’t see whether anything of value is being kept inside, while at the same time providing a well illuminated interior. 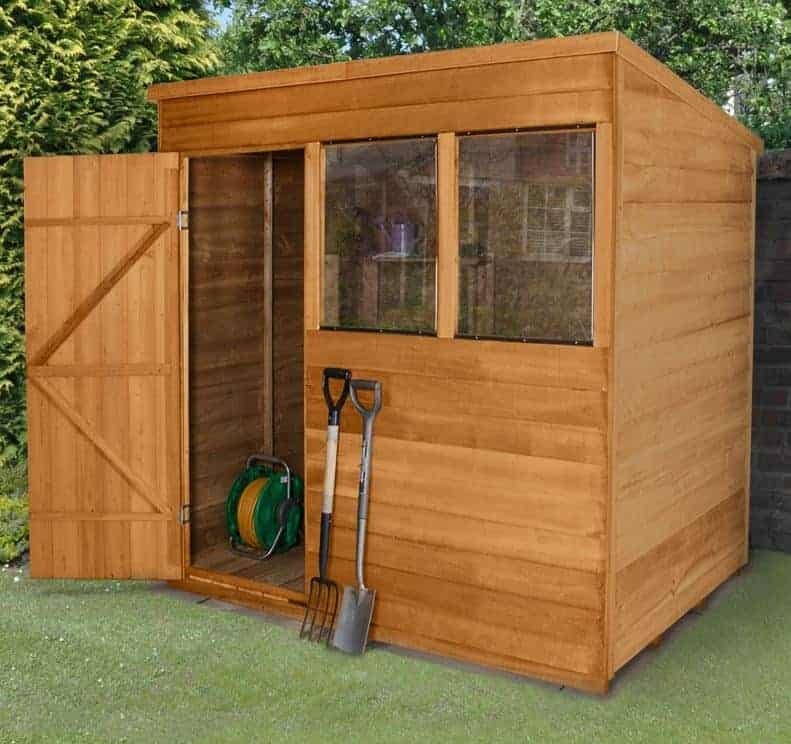 With a base area of approximately five foot by three foot these are the smallest outside storage sheds to gain a place within our top twenty league table, but this makes them ideal for use in a smaller garden where lawn space may be limited. The use of a pent rather than apex roof, although it still reaches a useful peak height of 1.80m, also makes this shed less obtrusive than many that we see. This in turn means that it can possibly be hidden away behind a wall or fencing, thus boosting its security. Whilst these outside storage sheds are small they’re also very tough, and it’s this quality that has earned them a place inside the top half of our league table. The coated steel cladding is thicker than most that we see, and they’ve been tested to withstand winds in excess of ninety miles per hour; if your garden sits in an exposed area that’s often subject to strong winds, these would be a smart storage solution. We also liked the SnapTite easily assembly system, making it simple to install even for people with little or no DIY experience. We were also very impressed with the 20 year warranty supplied by the manufacturer, which is an indicator of how durable and reliable these sheds are. 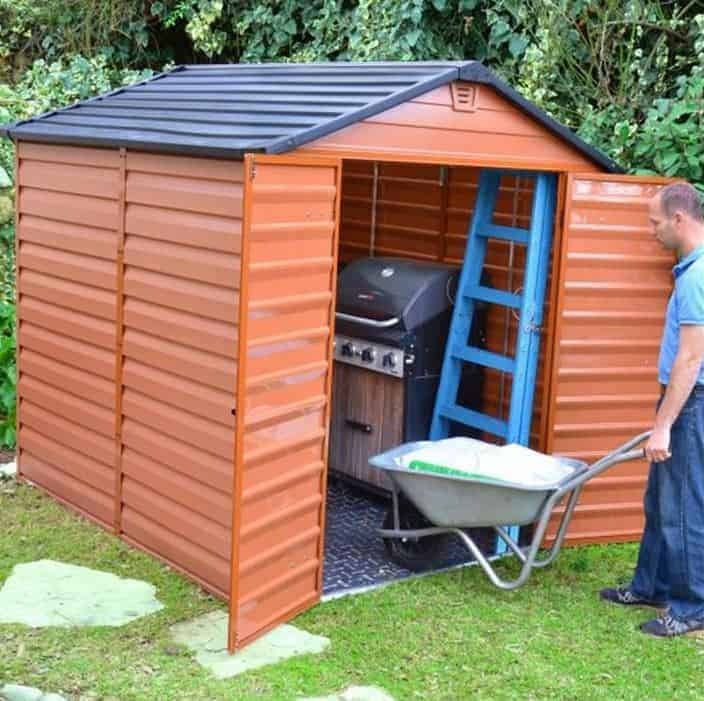 Whilst we always like to see tough tongue and groove cladding used on wooden outside storage sheds, overlap clad sheds can bring benefits of their own, as this excellent model shows. The cladding thickness is 8mm, as opposed to the 12mm thickness commonly found on tongue and groove sheds, and yet it still feels stable and solid once assembled. It also has a rustic look that we found rather attractive, so it should fit in nicely if you already have lots of traditional features in your garden. The biggest advantage of all, however, is in the asking price of just a little more than two hundred pounds. 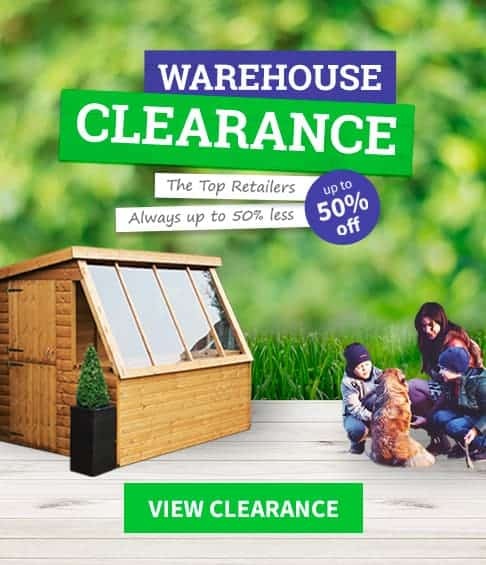 We think this is very good value for money for a seven foot by five foot shed, especially one with a 15 year warranty included. The long warranty found on these outside storage sheds is an indication that a pressure treatment has been applied to the timbers. It’s a feature that we always appreciate, but that we wouldn’t ordinarily expect to see in a shed that’s as affordable as this one. Another feature we were pleasantly surprised to see was the inclusion of double, rather than single hinged doors, which make it easy to transport large, wide, or bulky items in and out of storage. 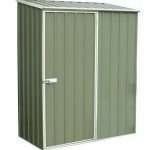 The Keter range of plastic sheds always catch our eye with their exciting and original designs, and it was good to see that this was also true of their six foot by six foot outside storage sheds. Whilst being made of plastic, the off white and grey colour scheme is visually pleasing, and we particularly liked the woodgrain effect applied to the cladding. This is also one of the best lit plastic sheds that we’ve reviewed, thanks to a square window on either side, and a skylight in the roof providing natural light from overhead. 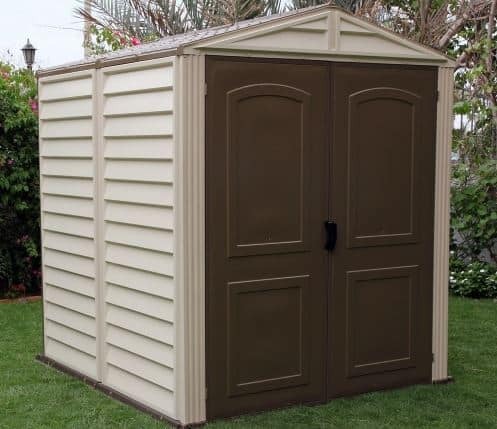 That’s why we think this shed would be an excellent choice for busy people who want to store and find tools and equipment in a hurry. A 10 year warranty is supplied with these outside storage sheds, and whilst that isn’t as long as we sometimes see given with the plastic sheds we review, we would expect it to last much longer without any problems occurring. That’s because the polypropylene resin used for the shed walls is durable and UV resistant, and it’s given added strength and stability thanks to its steel reinforcement. We also liked the inclusion of two shelves as standard, which isn’t something we often see provided with outside storage sheds, whether made of plastic, wood, or metal. This is the only one of our top twenty outside storage shed to feature a pentagonal design. The number of corners means that it loses a little from its seven foot by seven foot base area, but it also means that it’s suitable for compact gardens where lawn space is precious. That’s because it’s made to fit snugly into a corner of the garden, and this not only makes it a very space saving storage solution it can also give the building added protection against the elements. That’s one reason that the manufacturer has been able to supply a 10 year warranty against rot, although we should point out that this is dependent upon annual wood preservative treatments being applied by the owner. The five sided design of these outside storage sheds is not only practical, we found it visually pleasing as well, thanks to the symmetry achieved by a small square window on either side of double hinged doors. With a width of 1.13m these are among the widest opening doors we’ve seen on a corner shed of this size, which is a real bonus if you want to move wide or unusually shaped items in and out. We were also impressed by the inclusion of pressure treated floor joists, as they protect the shed as a whole from the threat posed by ground moisture. This is another pent roofed shed, but it’s very different in looks to the two previous models in our run down of the very best outside storage sheds that can be bought online in the UK today. Even though this again uses overlap cladding rather than shiplap cladding we still found it very eye catching, and that’s thanks to the single hinged door on the left hand side, with two adjacent windows dominating the frontage. It means that the interior is bright and welcoming on a sunny day, and as the windows are made of polycarbonate you won’t have to worry about them shattering or being broken into. The choice of plastic windows and overlap cladding on these outside storage sheds are both money saving options, but we were pleased to see this passed on to the customer. 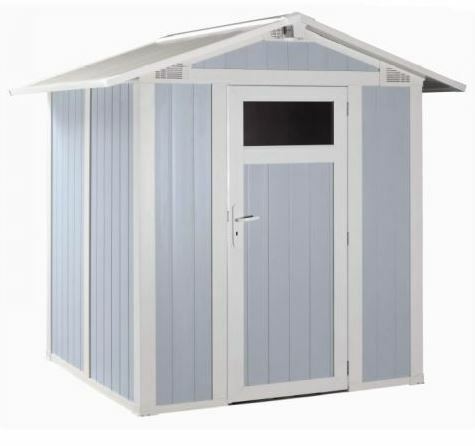 We feel that less than two hundred and fifty pounds for a seven foot by five foot shed represents very good value for money, particularly as a 10 year warranty against rot is included. 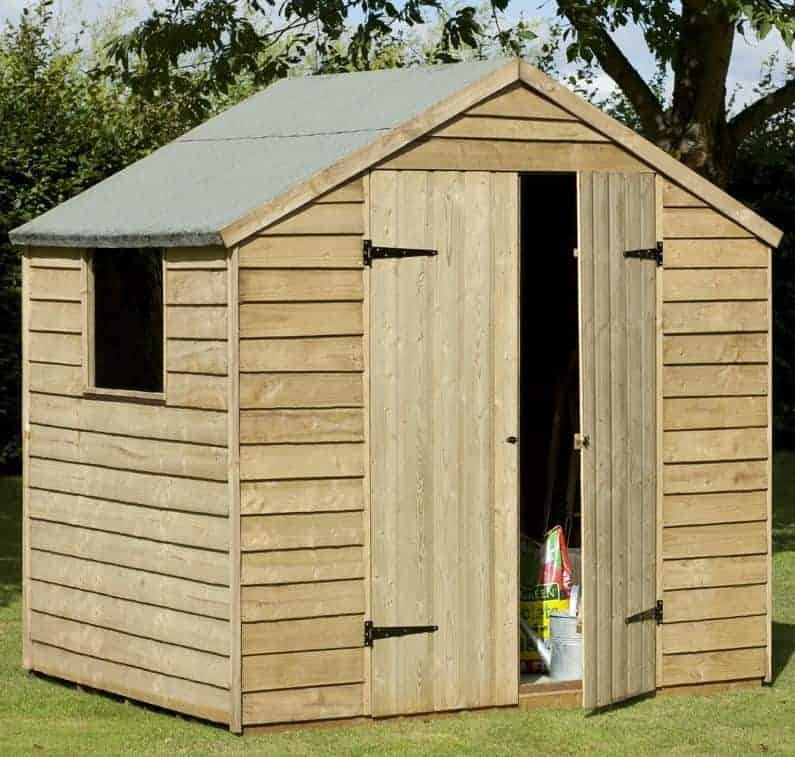 If you’re one of the many people who like the classic look that a well built pent shed provides, and want a well sized storage price at an affordable price, then this deserves to be added to your shortlist. Whilst in many ways these wooden outside storage sheds are similar to many others that they’ve reviewed, with an apex roof above a rectangular shed, they have one subtle and yet striking difference. The barge board has been given an oriental shape; it’s a little touch but one that we found very effective. Even in it’s natural state, which is honey coloured thanks to an initial dip preservative treatment applied by the manufacturer, this looks original and attractive, and we feel it should look even better once the wood has been painted or stained. 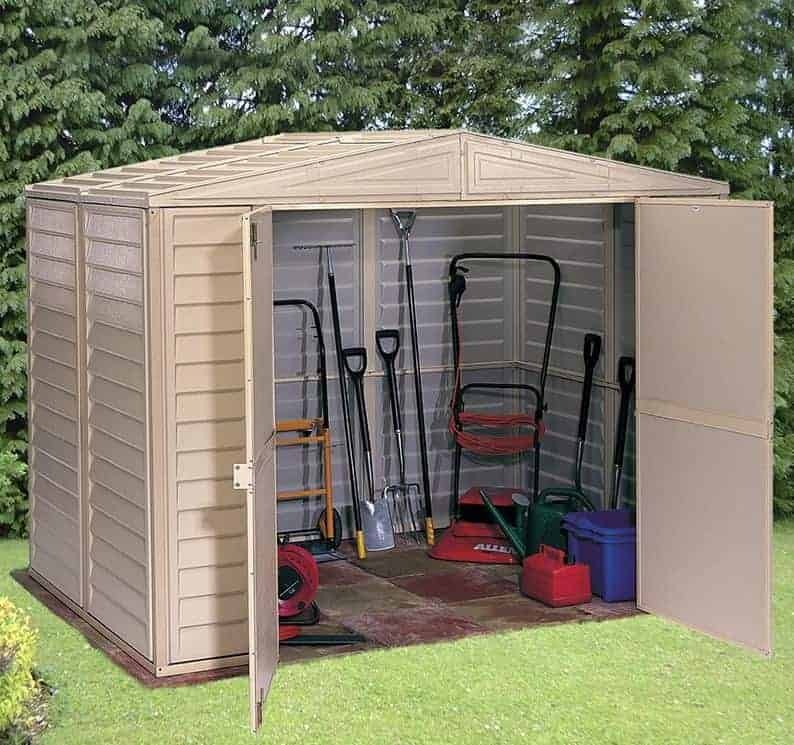 With an eight foot by six foot base area this is among the largest outside storage sheds in our league table, and so there’s easily enough room for a lawn mower or two alongside a generous selection of gardening tools and equipment. The taller than average ridge height of the apex roof of 2.14m also means that there’s enough room to move around in comfort inside the shed, and with three well sized windows there’s a lot of natural light to see by as well. 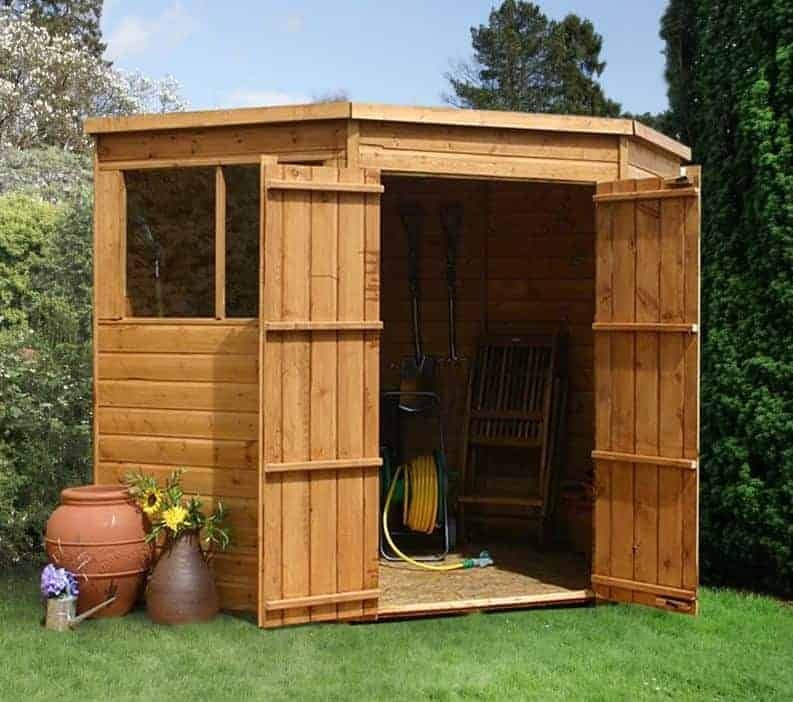 For that reason we can even imagine this shed being used as a garden office for those who work at home, as well as a very reasonably priced storage facility. Metal storage sheds don’t have to look silver grey and boring, as this Woodvale shed shows. It’s cladding is made of tough hot dipped galvanised steel, which gives it excellent protection against the elements, but it has a coffee colour allied to a darker brown frame that gives it a wooden look from a distance. The metal panels have also been arranged in an overlap effect, which we found very striking, and it’s excellent at channeling rainwater away. 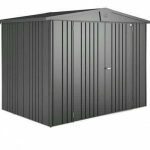 If you want a metal shed that doesn’t really look like you’d expect a metal shed to look, then this could be an ideal purchase. With a six foot by five foot base area this is very much mid sized when it comes to the outdoor storage sheds in our list, but there’s still enough storage room inside to meet the requirements of most small to medium sized gardens. Access in and out of the shed is easy too, thanks to the double doors that slide open smoothly and easily; that’s especially important if you’re carrying bags of soil for example when trying to gain access. It was also good to see that the handles on the doors were holed and ready to accept a padlock to boost the shed’s security. 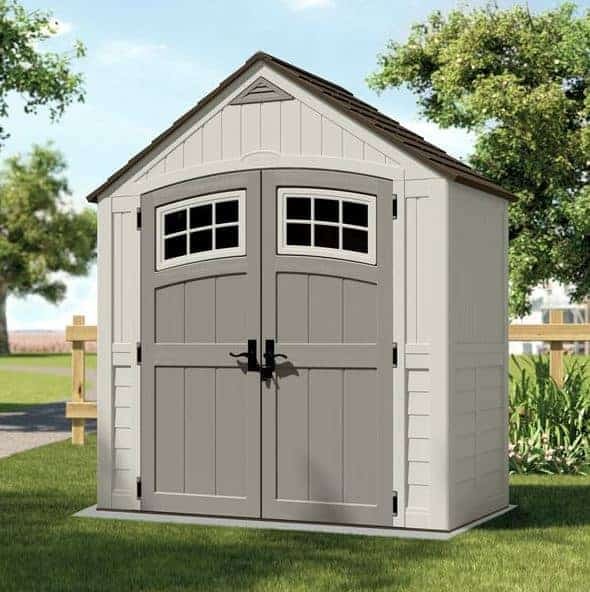 We always like garden buildings that have an original and yet attractive appearance, and just because storage sheds are not typically as ornate as summer houses, for example, there’s no reason why they can’t stand out too. This seven foot by seven foot timber shed from Windsor has an apex roof, as do the majority that we review, but in this instance it is offset so that the peak, at a height of 2.15m, is significantly towards the left hand side. Whilst being just as effective when it comes to the essential task of carrying rainwater away, it really catches the eye. This enhanced visual appeal was one of the reasons that this shed makes it into our WhatShed league table. We were also pleased to see that high quality shiplap cladding had been used for the walls of these outside storage sheds. Smooth planed, it too catches the eye, and as it locks tightly together it means that there are no gaps that rainwater can penetrate into. It also feels strong and stable when assembled, so you won’t have to worry about it being adversely affected by strong winds and storms. This is one of the reasons that the manufacturer has felt confident enough to provide a 10 year guarantee, dependent upon an annual treatment schedule being adhered to, and it’s a confidence that we share. This is the largest of all the outside storage sheds in our WhatShed league table, having base dimensions of 2.39 x 2.39m. 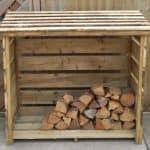 This makes it suitable for keen amateur gardeners who need a lot of storage space for all their tools, mowers and implements, and it could even be used for small scale warehousing purposes for people who operate a business from their home premises. It has an undoubtedly plastic appearance, with its white colour scheme, which we know that not everyone will appreciate; we liked its contemporary feel, however, and it should fit in well with gardens that already have white PVC elements to them such as fascias and soffits or a conservatory. Whilst these outside storage sheds come with a 10 year warranty from the manufacturer, we wouldn’t be surprised to see them far exceed this warranty period. They not only look tough, they feel tough once assembled, and of course owners of these sheds will be free from concerns about rot or rust. One thing that we particularly liked is that they are supplied with a foundation kit as standard. That makes it easy to create a level area of concrete to position the shed upon if such an area doesn’t already exist. It adds convenience, and adds value. 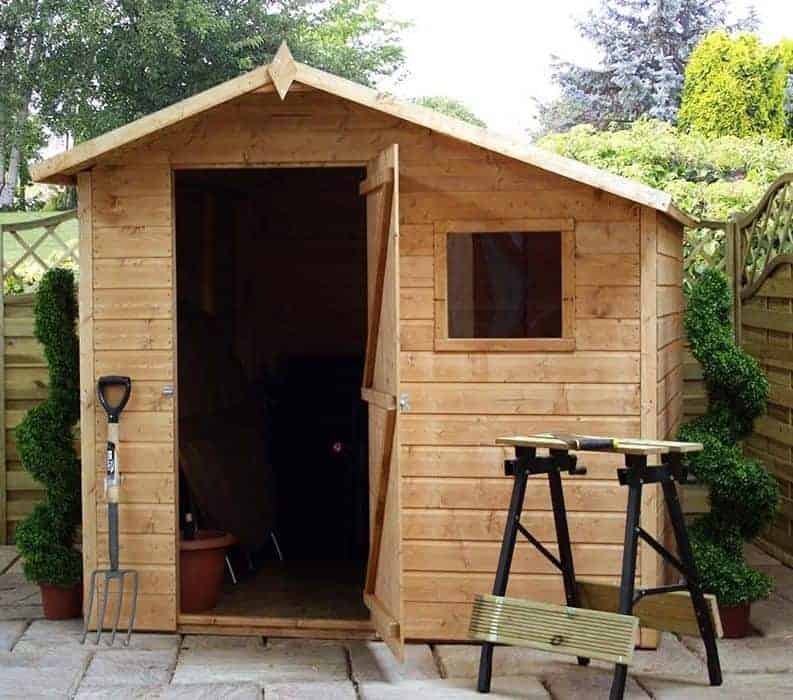 This is one of the most traditional looking outside storage sheds we’ve seen, and as we’ve come to expect with garden buildings from the BillyOh range it has good looks and is very well built. What first struck us about this shed is the bank of styrene windows running along the full length of one side, just below the roofline. This makes this one of the best illuminated eight foot by six foot sheds that we’ve seen, although we would have liked some of the four windows to be openable to allow ventilation in, rather than all being fixed as they are on this occasion. The other thing that struck us was just how tall these storage sheds are, with the apex roof having a ridge height of 2.22m. This is considerably greater than we see on most wooden sheds of a similar size, and it provides even greater storage potential if shelving units are added to make the most of the enhanced vertical space available. 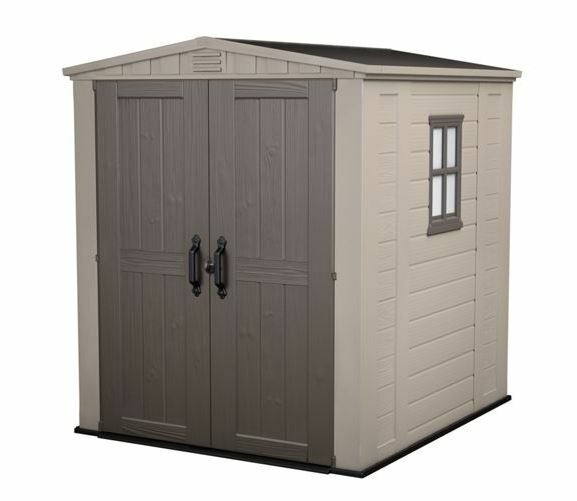 With a 10 year warranty included as standard as well, this is a shed with a lot to recommend it. It could have reached a higher ranking if it had included an integrated floor, and if the asking price was just a little lower. Whilst apex roofed outside storage sheds typically supply a little more head room, this isn’t as important in a storage shed where people typically walk in and out again in relatively quick succession. For many people, then, a pent roofed shed is preferable as a storage facility, as they are less noticeable and therefore potentially more secure. 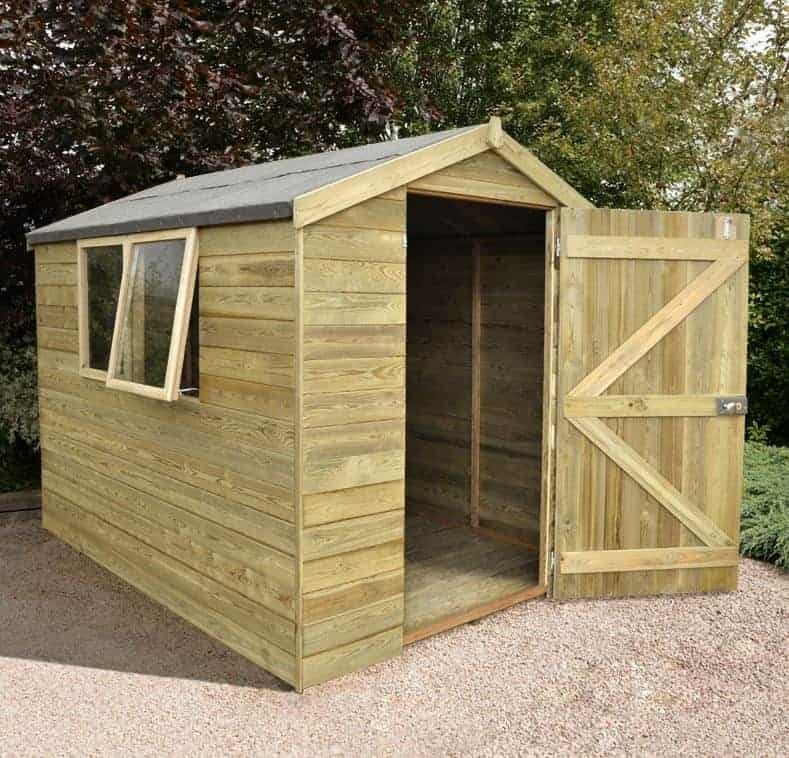 This is one of the most visually attractive wooden pent sheds we’ve seen as well, thanks to the use of smooth planed shiplap timbers and the long rectangular window alongside the single hinged door. The eight foot by six foot base area means that you can fit more inside these outside storage sheds than you might at first think, especially as the eaves height is a little taller and more accommodating than we often find on pent sheds. We were also pleased to see that a dipped basecoat had been applied to give it an initial protection against rain and therefore against rot, even though this means that further treatments of wood preserver will need to be added on a yearly basis. We would have liked to see an extended warranty included too however, and the absence of one is the reason that this shed finds itself in the final quarter of our league table. The reverse apex nature of these outside storage sheds is demonstrated by the width of 2.13m being nearly twice as great as the depth of 1.16m. This makes them particularly suitable for gardens that are relatively shallow. The double hinged doors make it easy to get into the shed, and also mean that you can use every inch of storage space available, so we were surprised and impressed by just how much could be kept inside. We also liked the curved top applied to the doors, an original touch that makes them stand out from the crowd. Unusually for plastic outside storage sheds, there are also small and curved windows on the doors as well, meaning that the interior of the shed is illuminated when the sun shines. Because of the size and position of these windows, it makes it hard for passers by to see inside as well, which is something that we always welcome. Another original touch was the shingle style roof, and as it’s steel reinforced it should prove to be tough and durable. We found this blow moulded resin shed as a whole to be tough and solid looking, and this would have been placed much further up our league table if it wasn’t for a price tag that’s significantly higher than average. These are the second Duramax outside storage sheds to feature in our top twenty league table, which shows what a reliable and high quality manufacturer they are. Whilst it shares the white vinyl cladding walls with the DuraMate model that we looked at earlier, this stood out for us from the moment we saw it thanks to the dark brown double doors that take up the whole of the frontage. It’s a striking contrast that we really liked, although it may not be ideal for those who prefer more traditional looking garden buildings. It creates a very wide opening as well, which can be particularly useful to gardeners who often use wheelbarrows when transporting goods. What we also liked about the double doors are that they are very easy to install. Whereas some doors that we see on outside storage sheds can be heavy and difficult to fasten into place, these come pre-assembled and simply hook onto a set of hinge pins that are already in situ on the door jambs. This is a plastic shed with a lot to recommend it, especially as it is maintenance free and should prove to be very tough and reliable. It’s also significantly more expensive than many of the six foot by six foot sheds we review, however, which is why it takes the penultimate position in our list. Grosfillex are the manufacturer of some of the most stylish and innovative plastic garden buildings that we see, so we were glad to see that their outside storage sheds lived up to the high standards we’ve come to expect of them. It has a very modern, almost futuristic, design, so we can see it fitting in well with homes and gardens that have a very on trend clean, minimalist look. The thing that struck us most about the shed was its pastel blue colour scheme, with white contrasts. It’s a colour scheme that we don’t see from any other manufacturer, and it’s sure to attract admiring glances from friends and neighbours. Another feature unique to these outside storage sheds is the rectangular window that takes up the upper portion of the centrally positioned single door. This is just enough to let a useful supply if natural light inside, but it should also stop passers by from seeing within; as they are sure to have their attention drawn by the shed that can only be a good thing. This is among the most attractive plastic sheds we’ve reviewed, but with its good looks comes a big asking price, and this is the reason it has to be content with the twentieth and final position within our league table.